Here is your free moving checklist to prepare for your move well in advance and avoid any last minute hassle. The checklist will provide you a complete to-do list from a month before your actual move, giving you enough time to make decisions, change plans and schedule your entire move. This checklist is mainly for residential moving in Phoenix, Arizona, but it can also be used for other purposes, with logical here’s and there’s. Having a checklist in hand gives you the power of management and organized moving. It helps to prevent any stress or anxiety regarding the actual move. You know you haven’t forgotten anything, because you have checked with the ultimate residential and commercial moving checklist. To start with it is very important to book a nice moving company like Cor movers at least a month before you want to move. Start making a list of everything you want to move and a list of unwanted items that you can probably donate or trash away. Tell your acquaintances about your move so they can help with whatever possible. Notify the post office about your address change since it usually takes time to complete the official process. Similarly, the insurance companies should be notified so that your policy can be transferred to your new house. Do not forget to arrange the utilities billings in your homes. Start picking up and labeling the items that you want to move. Keep valuables packed with yourself during the move. Make a plan to use the remaining food items in your kitchen or pantry. Make sure that you dispose of the flammables; these items will not be able to be transported. Clean the refrigerators and unplug and start packing up the utilities. Start setting up the utilities in your new home. Arrange for the transport of plants and pets, and decide on how you and your family members will be travelling. It is very important to have a bag of essentials with each of you for the journey, probably packed food for longer distances. Contact your moving company to re-confirm the schedule, or inform them about last minute changes. Make sure you have checked the check list till date, and make your own checklist for what you will need on the day of moving. Keep adding to the list as you remember new things and strike off the items that have been taken care of. Arrange and categorize your boxes. Give them a rank from first to last, on the basis of how they should be loaded. Remember this will be the exact reverse of unloading, so keep the important items and boxes towards the end. Pack the loose items into boxes with closed tops, to avoid losing them. Unplug the electronics well before they are being moved, so that they are not heated up while moving. Label the boxes with names of the rooms and be there with the loaders to check every item as it is being loaded or unloaded. Sweep of every room in the house as a final check and you are ready to go! 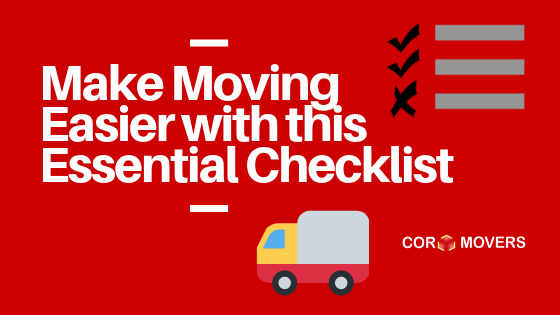 You can download the free checklist by Cor Movers, Phoenix, Arizona, which covers up all these important points and makes your moving easier! Contact Cor Movers today or request a quote now to start step one of your moving process!